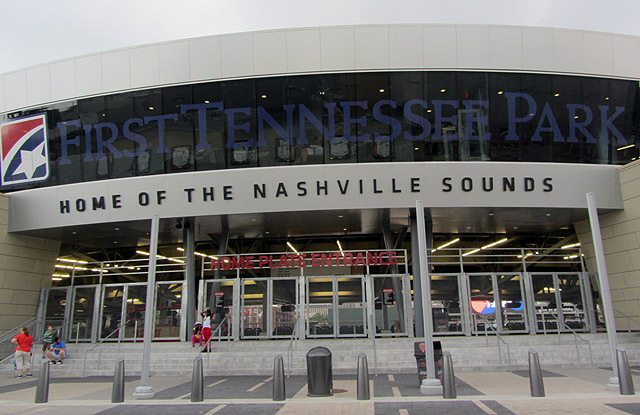 First Tennessee Park, the new home of the Nashville Sounds, has little in common with the team's previous home of Greer Stadium. But one key element remains. Actually, to use the proper music terminology, it's a string element: the guitar scoreboard. "I don't think the fans would have been happy if [First Tennessee Park] had a traditional scoreboard," said Sounds owner Frank Ward. 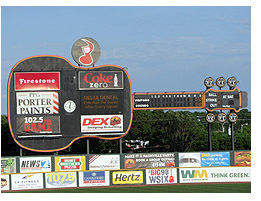 "Greer had a guitar scoreboard [shown to the left], but this one's a hell of a lot better. This one works. The other one didn't." The new scoreboard, built by Panasonic and located in right-center field, is a high definition behemoth. Doug Scopel, Sounds' vice president of operations, points out that the "big body of the guitar is the equivalent of 860 32-inch televisions." Additional digital square footage can be found on the guitar's neck (which displays the line score), headstock and even the six tuners jutting out of the headstock. 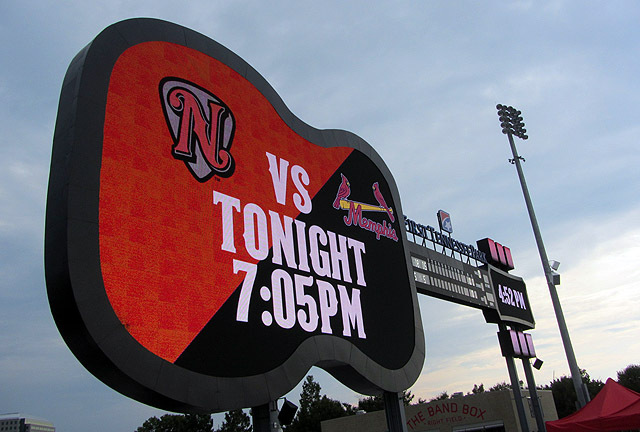 A discussion of the guitar scoreboard is practically a prerequisite for writing about First Tennessee Park. Nashville is the "Music City," and the team's name is a reference to the "Sound" that made the city famous. New team logos, adopted prior to this season, feature a stylized f-hole "N" overlaid atop a guitar pick. The Sounds are definitely not subtle about who they are and what they represent. The scoreboard may have its roots at Greer Stadium, but First Tennessee Park has a far more direct link to Greer's predecessor of Sulphur Dell stadium. That ballpark existed from 1870-1963, by which point it was advertising itself as "baseball's most historic park." But these decades of ingrained history gave way to the wrecking ball, and the site eventually became a wide swath of state employee parking lots. This was the reality until the advent of First Tennessee Park, which returns baseball to Sulphur Dell (located just north of Nashville's downtown). "The reason our mayor and our owner came to this site is because it brings development, and it brings baseball home," said Scopel. "This was Nashville's baseball home for 93 years. … We wanted to find ways to educate and honor the 93 years that had come before." 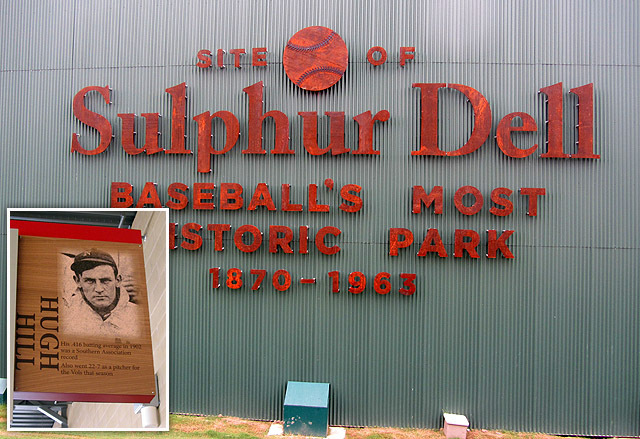 Most visibly, Sulphur Dell is commemorated via the rust-colored "Baseball's Most Historic Park" signage located behind the batter's eye in center field. Furthermore, all directional signage within the stadium is accompanied by a photo of a Nashville player who made his mark playing at Sulphur Dell. For instance, this concourse sign (inset below) highlights the prodigious two-way talents of 1902 Nashville Vol Hugh Hill. And fans wishing to honor the 1940 Vols squad -- ranked as one of the greatest Minor League teams of all time -- can pick up a replica jerseys in the team store. "Our Throwback Thursday [promotions] can go back a century now," said Scopel. But, of course, the location of First Tennessee Park wasn't dictated by nostalgia. The facility is largely surrounded by barricaded dirt lots at the moment, but change is imminent. The land adjacent to the facility is owned, variously, by the state of Tennessee, Metro Nashville and private developers (including the Sounds' ownership group). Much of the development to come, including condominiums beyond left field and a parking garage beyond right, has been spearheaded by Ward and his sons, Chris and Tim. 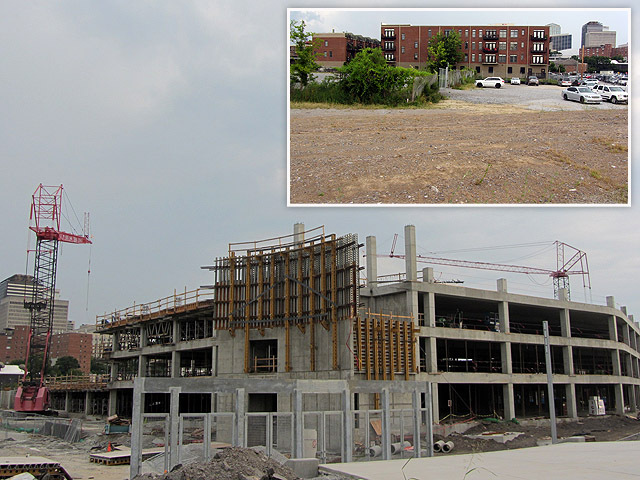 "Eighteen months from today, everything will be built," said Ward. "So this will be an enclosed ballpark at that time. … And we'll tweak the stadium every year. Add something different, add something new." But in 2015, everything's new. 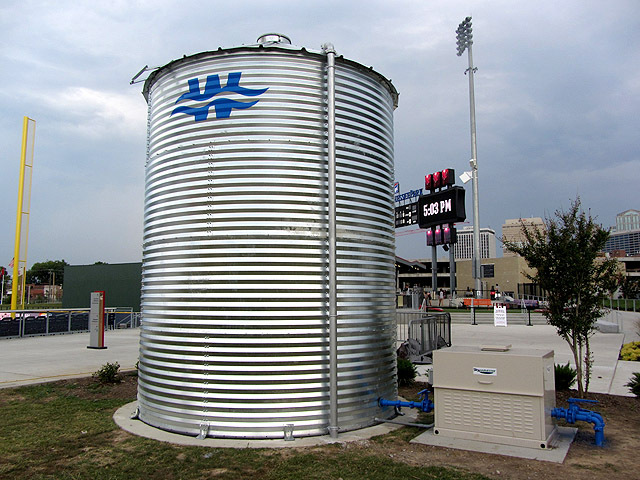 First Tennessee Ballpark is LEED (Leadership in Environmental and Energy Design) Silver Certified, and perhaps the most visible element of this green approach is the cistern located in right field. Rainwater runoff from the roof and storm water drain is pumped into the cistern, and the water is used for irrigating the playing field. "It's about reusing the water that's already here, so that we're not taking fresh water all of the time," said Scopel. 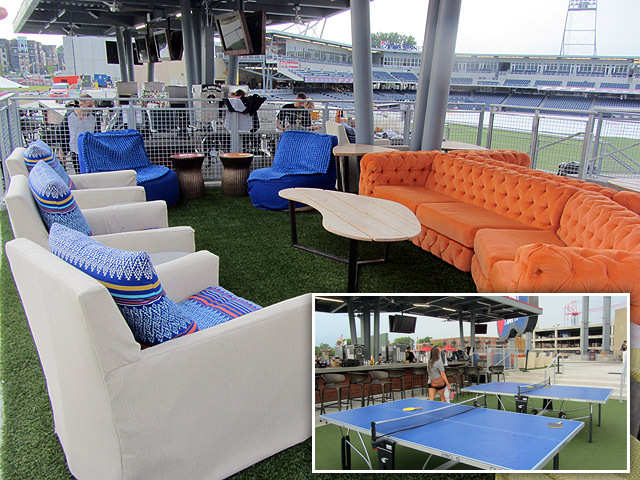 One standout feature of the ballpark is the "Band Box" bar, a concession and general hangout area in right field created in partnership with Nashville-based Strategic Hospitality (whose Nashville portfolio includes a half-dozen restaurants that are, for lack of a better word, hip). "The specific thought was to create a spot for the young-adult crowd," said Scopel. The Band Box includes a full-service bar, sprawling lounge furniture, ping pong tables, and, in what must be a Minor League first, a shuffle board table. The accompanying concession stand upends traditional ballpark fare, featuring the likes of quinoa chopped salad and nachos consisting of "smoked chicken, jalapeno queso, sweet corn pico de gallo, cilantro and crema." Those dishes, though exemplary, don't speak to the spirit of Nashville quite like the regional staple that is hot chicken -- fried chicken with a liberal application of cayenne-pepper based sauce. The Sounds' "Hot or Not" concession stand, located down the third-base line, features hot chicken provided by local purveyor Pepperfire. Tyler Glaser, my Nashville-based designated eater during the evening I was in Nasvhille, praised the Sounds' hot chicken offerings but also offered a caveat. "It's not as hot as what you'd get at an actual hot chicken shack. They're gonna knock you over," said Glaser. "This is tamed down for the masses, but this is a good starter." 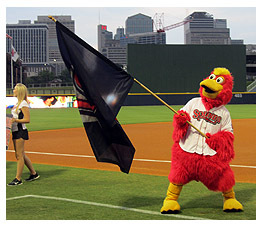 The Sounds' Hot Chicken commitment extends to their new mascot, Booster, whose origin story involves a baseball being knocked into a deep fryer at the Hot or Not concession stand. Yes, Booster is a hot chicken come to life. Unfortunately, the day I visited First Tennessee Park just happened to be the first rainout in the history of the stadium. 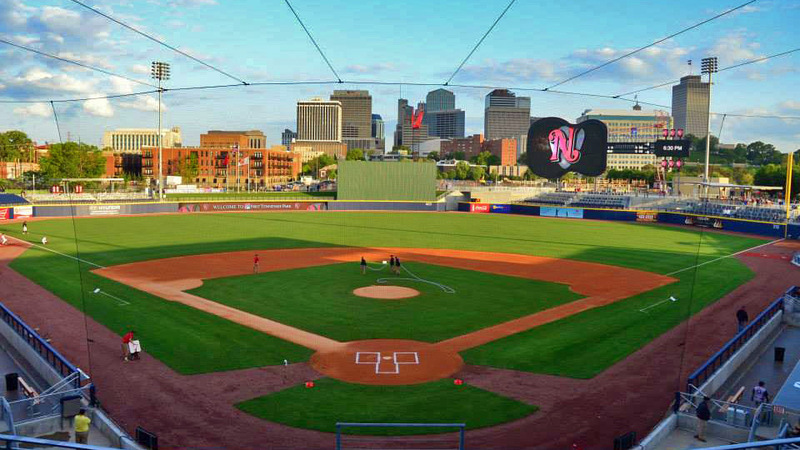 Nonetheless, stay tuned to Ben's Biz Blog in the coming weeks for far more from First Tennessee Park, covering everything from the field suites to the batting cages to what very well may be the widest dugouts in Minor League Baseball. Benjamin Hill is a reporter for MiLB.com and writes Ben's Biz Blog. Follow Ben on Twitter @bensbiz. This story was not subject to the approval of the National Association of Professional Baseball Leagues or its clubs.